An ancient art and science. The lines of your hands are a mirror of your soul. Through palm reading you will get in touch with your higher self. The chief lines of the hand are Life Line, Head Line, and the Heart Line. The strength and the direction of lines in conjunction with each type of hand will determine the actions and habits and the significant events in the life of a person that will lead to success in career, health, wealth, love, marriage, children and happiness. Your expectations might be that she will tell you what you already know, or that she will just give you predictions about your future. Predictions, however, are of limited value by themselves, and must be considered in context to the present. A good reading is intended to tell you more about yourself as you are now, rather than what will happen in the future. The real value lies in her helping you understand yourself, your current situation, and the problems or conflicts you might be experiencing. Using the power of Synchronicity, Angel cards tap both the subconscious and the super conscious Mind, the center of our psychic abilities. Each card is symbolic of an energy or spiritual truth, its relevance depending upon its position in the spread. Psychic energy is a life force that flows through every particle of the universe. 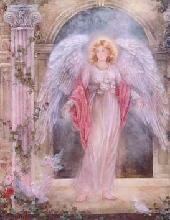 Psychic work, such as divination through Angel cards, is a means to map out the influences in our lives.